This interview is the first of a two-part series on the role and importance of festivals in a global world. This interview will focus on Europe. This time of year, all around the world numerous festivals take place. They can be seen as a celebration of new life emerging from winter. But, as opposed to a traditional definition of festivals, today, the term ‘festival’ refers to a far more diverse, complex and multi-layered reality. It is more akin to a time and a place that combine different artistic and professional ideas, where individualities (a person, group, city, region or country) are promoted, confirmed and brought into the light of an international context. What do ‘festivals’ mean in a global world? How are they perceived in Europe compared with Asia? What is their dialogue, keeping in mind EU and Asian practices? Let’s analyze them on a performance sequence, criticized by Richard Schechner: Time before the festival >> proto-performance, Time during the festival >> performance, Time after the festival >> aftermath. In this context, I had the great pleasure to interview Madame Kathrin Deventer, General Secretary of European Festivals Association for her views. 1. What is the purpose of the European Festivals Association? The European Festivals Association (EFA) is the network of arts festivals from Europe and beyond. In 2012, EFA will be celebrating its 60th anniversary, 60 years of networking, 60 years of activities, 60 years marked by dramatic political, social and global changes. A huge challenge to remain ‘meaningful’! Today the Association has grown into an open and dynamic network representing more than a hundred music, dance, theatre and multidisciplinary festivals, national festival associations and cultural organisations and their 2000 members from 38 (mainly European) countries. Based in Belgium close to where international cultural policy is made, the European Festivals Association is in a pole position to open up festivals to artists and all kinds of audiences from around the world, to politicians, business people and the media. The Association raises awareness of the vital role played by festivals in today’s world. Our modern, rapidly changing societies need as much inspiration and creativity as they can get! This is where festivals come in, offering artists the chance to create and audiences an opportunity to see their work. EFA’s role is to support festivals in their important mission. Every year, it implements a broad array of activities - taking a different angle every year, making sure that festivals open doors, open minds and contribute to building societies! EFA sets up networking opportunities, releases books, provides training, and invites festivals from all over the world to engage in bold new initiatives. We give an international continuous input, and allow festival makers to step out of their sometimes very urging daily routine: I think that networking on an international level, exchanging, extending horizons is more important than ever. Festivals are key triggers of international cooperation. They foster intercultural dialogue and create a fruitful ground for the development of innovative and creative talents and competences. In short: festivals have the unique ability to “open doors” in a variety of ways. They open doors to artists and audiences. They open doors to new artistic forms, new performers, new audiences, unusual venues, unknown cultures, new points of view, new approaches to arts and the world, new social orders, new political discussions. 2. How does EFA succeed in bringing festivals together? Is there any specific programme or exchange project that links one festival to another?Throughout the year, EFA offers meeting and networking opportunities to its members as well as to festivals beyond membership. One example is the ARS NOVA meeting for contemporary music. This is an annual thematic conference dedicated to the festival business and linked to the General Assembly. Another example is the EFA Collective and Affiliate Members’ Meeting which brings together festival networks on a national level and the European cultural networks. All these gatherings take place in different cities that link the international dimension of EFA with local contexts. They often result in concrete collaboration projects between members, for example the MUSMA project that was born thanks to the EFA initiative “FestLab for Creativity and Innovation”. As such, EFA offers a platform to step out of a daily routine. It also offers a structural platform to set up long-lasting relations and co-operations. What’s more, EFA offers training and educational opportunities for young festival managers: The European Atelier for Young Festival Managers is a unique, intense, one-week training programme that was initiated by EFA in 2006. It brings together 45 emerging festival managers with renowned festival operators, professionals and artists. At the last event in Varna, no less than 21 countries were represented, including Asia, Africa and America. The 3rd edition will take place from 23 to 30 October 2011. Pre-registration is open already! I organised the last two Ateliers, and I can tell you that the spirit, the atmosphere, the inspiration, the generosity of festival leaders, were all amazing to see growing in this one-week Atelier. However, though the programme is just one week, it is a starting point for a totally new network that lasts long after the event is over. See also: the Atelier 2009 on facebook, the Atelier report, the daily news report from the Varna Atelier! Last but not least, each year EFA focuses on a series of working group meetings based on a specific topic. In this context, EFA identifies festivals who share a certain interest and allows a smaller group to discuss and develop projects. In 2008 these meetings focused on intercultural dialogue, in 2009 on creativity and innovation and in 2010 on access to culture. All in all, these meetings are important to bring EFA’s overall mission to life. 3. Does EFA gather expertise or different practices? Please tell us a few successful stories? Knowledge only has a real value when it is shared. In this spirit, EFA shares and supports the sharing and passing on of knowledge. We do so on the website where we gather knowledge on festivals via the publication of reports, studies, papers, impact assessments etc. Another strong instrument of knowledge sharing is the EFA BOOKS series. The BOOKS series is a unique compilation of approaches of festival directors and personalities from the fields of arts, culture and politics. They share about their work with festivals, about networking in general and broader issues touching on arts and culture in society. EFA does not only gather these practices but ensures that these experiences receive broad attention: the books are distributed broadly and are available on the EFA eShop. Of course, the European Atelier of Young Festival Managers is in itself a success story of knowledge transfer. The unique group of experts from the field know the importance of sharing their expertise with the next generation. To ensure the most effective results, this is done in working groups and lectures, interactive exchanges and insightful face-to-face talks about case studies. Another success story is the collection of best practices related to certain issues: intercultural dialogue, creativity and innovation, social inclusion etc. Thematic approaches lead to an overall festival code of conduct that is aimed to be endorsed by festivals from all over the world at the EFA’s 60th anniversary. An easily accessible starting point like ‘open the door’, developed further into a broader reflection. Ultimately, political recommendations is what EFA tries to offer through its flagship projects. 4. In Europe, are festivals organized by a private or a state institution? The practice is very different from one country to another. Festivals in eastern European countries still tend to be set up and supported substantially by public authorities than in west Europe. Their governance is closely related to the municipalities. In the majority of cases though, festivals are organised and implemented by not-for-profit organisations. Of course, the healthiest situation of a very well balanced financial income is through private sponsoring and public subsidies. 5. In general, what is the period in which the team of festival works? During the entire year, or only in a period before and after the time in which the festival takes place? Please give us some examples of different practices. The question of organisation of the staff within a festival has different answers. Many festivals have a core team that is increased during the festival period with project managers, short-term contractors and of course many, many volunteers and students. But also this practice differs a lot from country to country. In Belgium, students frequently take up a post to earn some extra money or gain practical experiences; in Iceland this is not so. Also, it depends very much on the set up of the festival. More and more festivals, like the Berliner Festspiele, are overall arts organisations that are almost permanent institutions that run events throughout the year. Others, more niche-oriented smaller festivals are focused on one or two weeks at a time. They of course have another rhythm. There are several studies on the EFA website that look into the organisational set up of festivals. 6. EFA also included festivals from Asia. What is in your opinion, some features that differentiate practices from EU and Asia? Festival life in Europe is a very old phenomenon. First festivals as we know them today were set up in the 19th century. To give just a few examples: the Salzburger Festspiele were founded between the two World Wars; the Edinburgh International Festival just after, as well as the major festivals in Granada, Varna, Ljubljana etc. These post-war experiences guided the life and the mission of those festivals in their first years, as it still does today. A festival is deeply rooted in its local and historical context. This is why per definition there are many differences. But at the same time there are common features, qualities and challenges that all festivals share. These include the artistic quality, sustainability in all its facets, its cultural and social relevance in society, its ambition to foster intercultural dialogue to name a few. Asia is as diverse as Europe – and so are the arts festivals both continents generate – be it music, dance, theatre, film, multi-disciplinary festivals. There are even very interesting philosophy festivals, literature and poem festivals today. A cross-fertilisation of genres, of artistic disciplines, and of geographical origins are an important objectives for EFA – with its focus on supporting diversity. EFA today has members in 38 countries, from 4 continents. It is impossible to generalise – and it seems that more networking and exchanges including structural relations between the European and the Asian festivals association are needed, as well as a structural flow of information between Africa and Asia. Conferences that bring together actors from different countries and continents, but also digital tools and platforms such as culture360 will be indispensable for providing this information! In order to foster the exchange between festivals from both continents and allow learning from each other’s experiences, EFA is in close contact with its Asian sister organisation, the Association of Asian Performing Arts Festivals (AAPAF) (www.aapaf.org / http://www.aapaf.org/Default.aspx?tabid=78): Each year EFA sends a delegation of European festival directors to the Shanghai Performing Arts Festival and Fair (http://www.artsbird.com). What’s more, EFA is planning to organise an Atelier for Young Festival Managers in Asia in June 2011. In previous editions of the Atelier, EFA had already welcomed young festival managers from Asia. 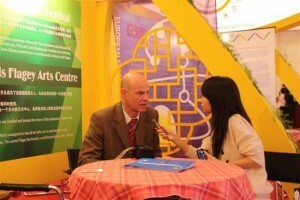 EFA is welcomed by the World Festival Conference together with AAPAF in Shanghai on 28 September 2010 in the framework of the World Expo. Many of these questions will be answered more in detail during that conference and we are looking forward to sharing more information with ASEF after this meeting. 7. Have you participated to a festival in Asia? Please tell us a little bit about your experience concerning the organizing, structure and promotion of the Festival in question. I visited the JakArt Festival for the first time in 2008 (report). In 2009, I participated in the AAPAF General Assembly and the China Shanghai International Arts Festival (report). From its outset, the JakArt Festival is a totally different experience than the festival in Shanghai – and most probably from the very international and innovative festival approach of the Singapore Arts Festival which is collaborated and co-produced with a lot of European artists. Festivals acting as platforms for international creation is definitely an issue that EFA together with the Asian festivals has to embrace and lobby for in the future. Before we can speak about promotion, we have to emphasize that the core mission of a festival is an artistic one which offers the artist a platform to dare, to risk, to fail. It allows the artist to extend horizons, set new limits, challenge, raise questions. As associations, we have to advocate for the most favourable conditions that allow festivals to take on this role. That is why for instance the relation with AAPAF in the future as well as the participation of festival managers in Europe as well as the Asian Atelier is important! 8. What is, in your opinion, the most successful selector? The artist or the manager? Or is it more about the artist [artistic director] working together with the manager (executive manager)? Please tell us some examples from the different practices in EU. To reply to this question, I suggest reading more about the Atelier. Another good source are examples of programmers who discuss and write about their relation with the artist, as artistic manager, as general manager. I would also like to invite you to have a look at the “Cahier de l’Atelier”, the third volume of the EFA BOOKS series. “Cahier de l’Atelier” is an invaluable reference book about arts festivals, full of vivid personal anecdotes, thoughtful insights and inspirational, daring visions. In it, EFA has given the chair to renowned directors Bernard Faivre d’Arcier, Frans de Ruiter, Gerard Mortier, Nele Hertling, Sir Brian McMaster, Gavin Henderson, Rose Fenton, Darko Brlek, Tom Stromberg, Ritsaert ten Cate, and Hugo De Greef. Each of them has invaluable experiences to share and each of them shares the view that whatever their differences, all arts festivals must be there for art’s sake. In “Cahier de l’Atelier”, these men and women evoke their experiences, the challenge of creating arts festivals and the relation between artist, programmer and audience. We are now preparing the next edition in which female festival directors that stepped down at a certain point from their festivals share their personal experiences: I am very much looking forward to this edition! 9. What is in general the structure of the team in one festival? What are the most important roles of each member/department? A very classical set up is reflected in the Edinburgh International Festival. It covers the following departments: the artistic one, communication and marketing, sponsoring, administration and finance, the technical department, education and outreach as well as ticketing. The role of EFA as a network in this context is again to provide a platform for its members to exchange on issues and interest they have in common. Again, I would like to refer to the Atelier that touches upon a variety of issues. Particular emphasis is given to the artistic aspects of festival management including the artistic vision, political and social responsibility, internationalisation, networking, renewal and sustainability. Other issues and how to face related challenges are topics of EFA working group meetings. For example EFA has launched a new meeting format, the “EFA Meets Its Regions” meeting that brings together festivals from a certain region, for example the Balkans. The scheme has been established to offer the opportunity to meet and get to know festival representatives who – due to their geographical neighbourhood – share common interests and face similar challenges. The discussions in the framework of those meetings are very fruitful for all participants. The sharing of knowledge is key! Kathrin Deventer is Secretary General of the European Festivals Association (EFA), the representative umbrella organization of arts festivals from 37 countries all together. EFA communicates through facilitating cooperation among its members, engages in training and education for young festival managers. EFA supports research and know-how and plays an important role in advocacy and lobbying activities to make the voice of festivals heard in the ‘cultural debate’ at a European level. The Arts Festivals’ Declaration on Intercultural Dialogue is a flagship project in this context.